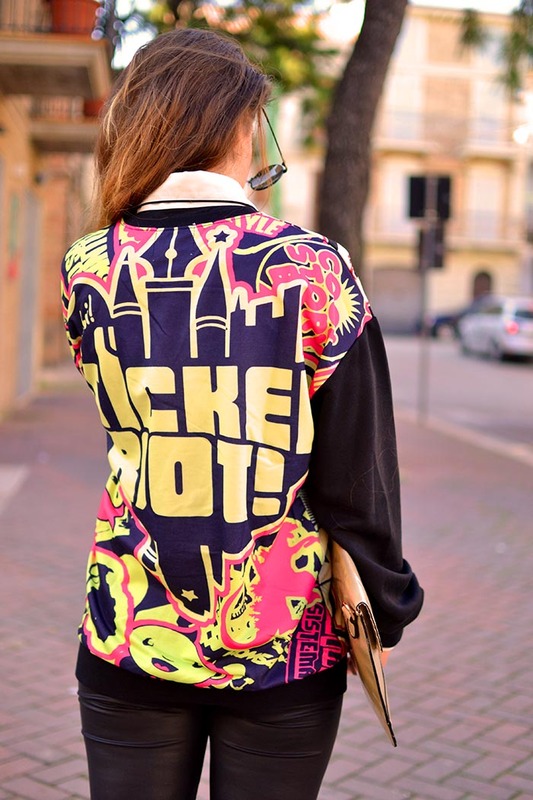 I got this funky pullover from Chicnova. The shop I’ve discovered recently and I liked the garment collection. So many cool items to buy. I’d like to share with you just a few findings that I like. Great look! The sweater is so awesome! You look adorable and these snapshots are gorgeous! I love it! !it's so funny!! Wow Nico che bellissima felpa !!! E poi gli occhiali sono bellissimi !!!! I like a lot the hoodie, is very funny. and where are the shoes?, just I was looking for something like that now. Hi, my love. Thank u so much. The shoes are Via Spiga brand. I bought them in Italy and I'm not sure if you can find them abroad. But something similar I'm pretty sure is available in any country. So chic! You can go tu the fashion week! I love it! ADORO QUESTO OUTFIT IN TUTTI I SUOI DETTAGLI!! p.s. nuovo post, ti aspetto! La felpa mi fa impazzire! Vado subito a vedere il sito! 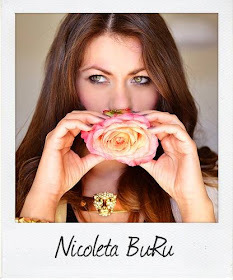 Nicoleta_B very good look.My pretty I love you so much.Many Many kisses. Gorgeous look, i want your pullover darling! Sempre particolare e splendida ! Great smile on the last picture! Wow! I love the jumper! quite daring! but you pull it off, you have a beautiful blog. AHHH love this soooo much! Sooo cool! You are forever looking stunning sweetheart. Loving the brogues and sweater so chic. Avrei messo solo un'altro paio di scarpe, per il resto il look è impeccabile!! 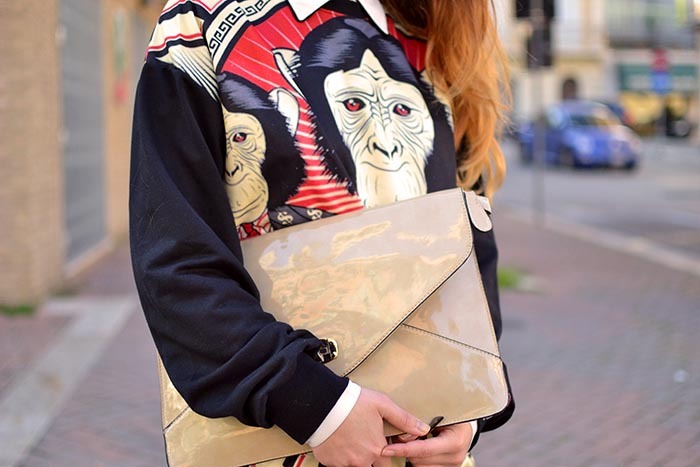 splendid pullover ! :) Give it to me ! I find it very funny and cool!! wow! the sweatshirt is beautiful! ador acest pulover!!! cat este de frumos!!! I love every single piece! Maglione e scarpe bellissime (: Reb, xoxo. so original shirt, but i love your oxfords! really amazing! This is so unique and amazing! You can seriously pull any look off :) I'm so jealous! 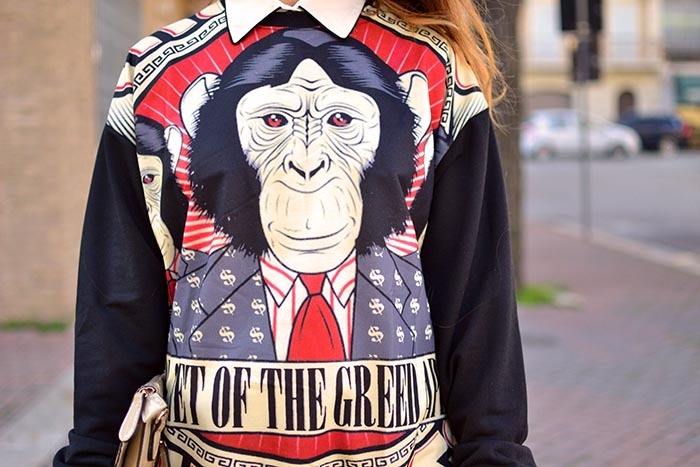 Thats a awesome sweater you are wearing. Love it! enter my international giveaway at tie-dye-eyes! Un look original y muy bonito. Wow love how you paired such a stunning and outstanding top. Love the shoes as well!! That shirt is awesome! And the glasses are really cool! the sweater is so unique and nice! I love your sweater! !amazing outfit, good choice the moustarde shoes!! I lovee your shoesss lady!!! Love the shoes and sunglasses. I love this sweater!! So much fun and the leggings are so great too. The sweater is so fun!! Love! How I like the sweater! And the shoes are so nice, too. 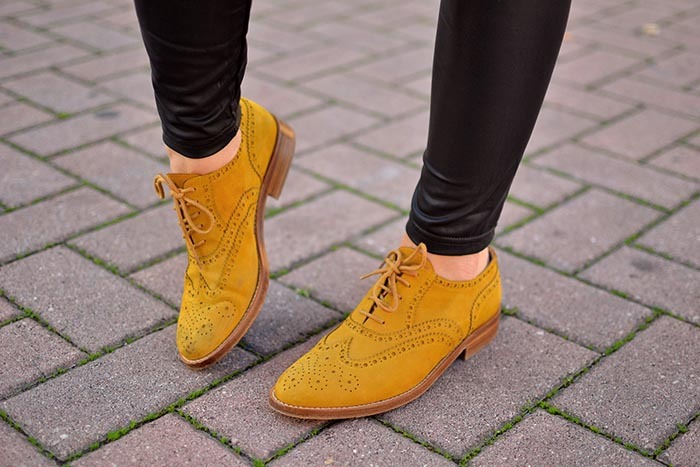 The top is fun, but I'm really liking the mustard suede wing-tips! Love the sweater and shoes! so glad i found your blog. you have such great style! this sweater is the next best thing and i love it the way you match it with the shoes! lovely look! this sweater is very pretty - I've seen it million times on otherbloggers and always it looks different. your styling is lovely! Quanto stai bene! Hyped tesoro! 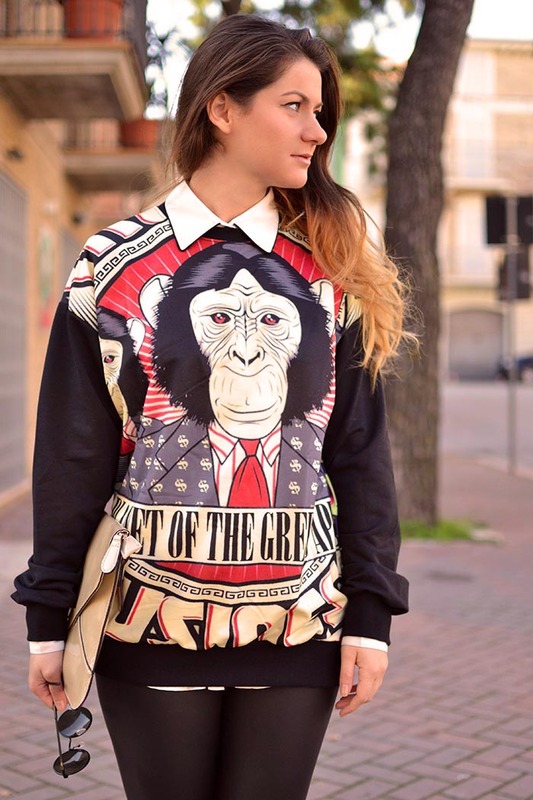 Adoro la felpa!!! Love the sweater with such a tailored look! The collar and pants make it pop! You always charm, always glamorous, always urban! I like so much your outfits. OMG You look great baby!!!! this sweatshirt was in my wish list!!! really like it. You look really beautiful, and the outfit is perfect! Your top is fabulous ! Want to follow each other on bloglovin'? May I just say: that sweater is freaking awesome!!! RAD! Playful Sweater, nice detail on the back & front! Great outfit, I'm in love with the top, it's so original! A trecut ceva vreme de cand nu ti-am mai lasat un comentariu, asta datorandu-se faptului ca am avut o saptamana ingrozitor de aglomerata. Maine o sa updatez tot ce am pierdut saptamana asta. Imi place mult pull-over-ul, e foarte interesant imprimeul. Draga mea, la mine pe blog te asteapta un premiu. Te pup si sa ai maine o zi buna! Ok, that sweater is amazing! I love it! It's so fun! so trendy!! love your pullover :) kisses and happy weekend dear! So so GORGEOUS!! Love the sweater!! My dear Apes :))) I'm jocking!!! My dear, Birds - Thank you so much for your lovely comments and your sincer oppinion. Love your all. Looooots of Love!!! Great outfit! The pullover is so cool! Love it!